If you like Whoppers, you'll LOVE these Malted Milk Ball Cookies. These cookies are so addicting and they don't last long. Tender and chewy, this flavorful cookie is a breeze to make. These old fashioned cookies are almost equally part candy and cookie. The candy part is chunks of chocolate covered malted milk balls and big chips of chocolate. PREHEAT oven to 350 degrees and line two baking sheets with parchment paper or silicone mats. Sift the flour, malted milk powder, cocoa, baking powder and salt. In a large mixing bowl, beat the butter and sugar on medium for 3 minutes or until very smooth. Add the eggs, one at a time, and beat for one minute after each addition. Add the vanilla and don't be concerned if the batter looks like it is curdled - it will even out when you add the dry ingredients. Reduce to low and add half of the dry ingredients only mixing until it disappears into the batter. Mix in the milk, then the remaining dry ingredients, mixing until they just disappear in the batter. Do not over beat. The batter will look like frosting, and that is fine. Fold in the malted milk balls and chopped chocolate. Drop the dough by rounded tablespoons onto the prepared baking sheets, leaving 2 inches between spoonfuls. Bake for 11-13 minutes, rotating the sheets from top to bottom and front to back after 6 minutes. When done, the cookies will be puffed and set, but slightly soft to the touch. Let them rest for two minutes and transfer them to cooling racks. Repeat with remaining dough, cooling the baking sheets between batches. Kids will devour these delightful cookies before they had a chance to completely cool. 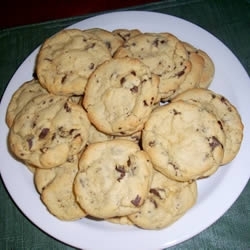 I have more than a recipe for malted milk ball cookies, check out more of my homemade dessert recipes at the links below.